The packages come ready-to-use and are simple to install and to monitor. No configuration is needed. Hardware is shipped fully configured and activated on the ThingPark Wireless Network. Therefore, you only have to install the devices on your premises, connect the gateway to the internet and start to monitor your assets on the Application. 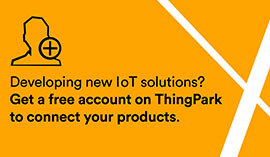 To provide the best user experience we use single sign on so you can access all applications via the ThingPark user portal, and use the same credentials when you access the partner’s apps directly.